You can buy books from other sellers and download them to your NOOK Tablet. Many public libraries and educational institutions allow you to borrow reading material. Most of the files are in EPUB or PDF format, and they usually have Digital Rights Management (DRM) restrictions (to put a time limit on the loan of materials). Lots of companies manage eBook loans with lots of tools. The leaders include Adobe Digital Editions and Overdrive. In addition, Amazon introduced in late 2011 a lending library for who bought their newer eReaders; that company, as is its wont, manages the lending process with its own Kindle tools. Other vendors of books, like Kobo, have their own systems. The Adobe Digital Editions software is free and easy to use. On a desktop or laptop computer, use a web browser connected to the Internet and go to Adobe Digital Editions. 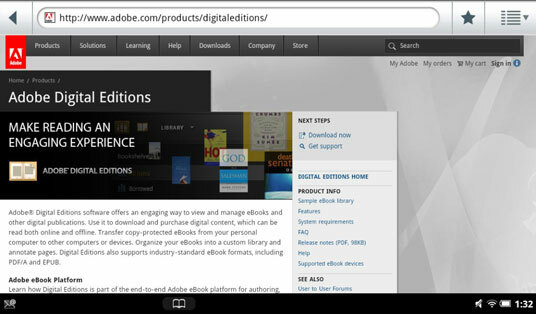 Download the Adobe Digital Editions program. Make sure it’s the right version for your computer. Install the program on your desktop or laptop computer. Follow the instructions to authorize your computer. Turn on your NOOK Tablet. Plug in both ends of the USB cable that came with your NOOK Tablet. One end goes into the computer and the other end goes into the NOOK Tablet. Make sure to use the right USB cord. Launch Adobe Digital Editions on your desktop or laptop computer. One end into the computer and the other into the NOOK Tablet. Make sure you don’t force things! Drag files you have downloaded from their location on your computer’s desktop or a folder onto the ADE library bookshelf. They will be available for reading on the computer, but your goal is to get them onto your NOOK Tablet. Follow the instructions to move those files to an authorized NOOK Tablet. Some stores and libraries use a program called Overdrive. In one version it works a lot like Adobe Digital Editions. A second version goes directly on tablet computers. Download and install the Overdrive app on your NOOK Tablet. With your NOOK Tablet, go to a store or library where you have an account. Choose and download book files to your device. If you’re borrowing from a library, the book may come with a time limit. If you’re buying from a store, the cost is charged to the account associated with the Overdrive app. Overdrive is available for many Android-based tablets, but the NOOK Tablet is not amongst them, at least right now. Keep on the lookout, though.